We heard a lot about the south coast. Most, of what one hears, does not provide great references for why it should be paddled. It is viewed as something that has to be done if a circumnavigation is to be successful. Some choose to do it at the start, to be done with it before enjoying the rest. Some do it at the end, when they feel strong enough to sustain it. 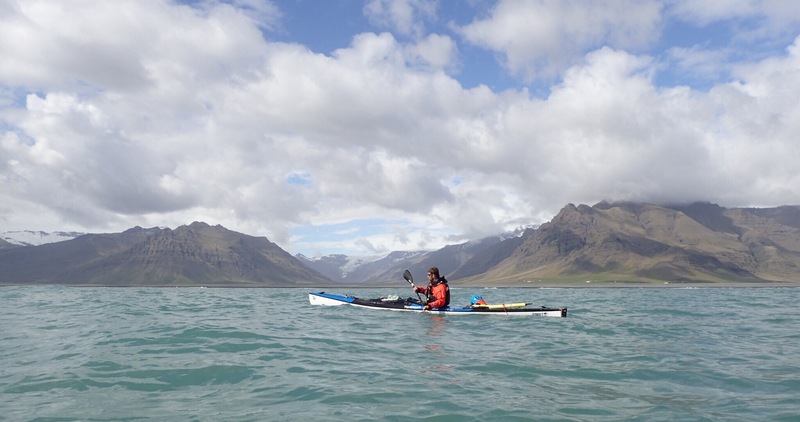 We chose the second option as we felt that first we needed to become familiar with the environment and specifics of paddling in Icelandic waters, get stronger, and build up our stamina to make good progress along the endless stretch of this coast without ports and safe landings. South coast is a place where the sea and rivers are constantly fighting over glacial and volcanic deposits. Rivers are creating ledges and shallows in the sea where the surf violently breaks. 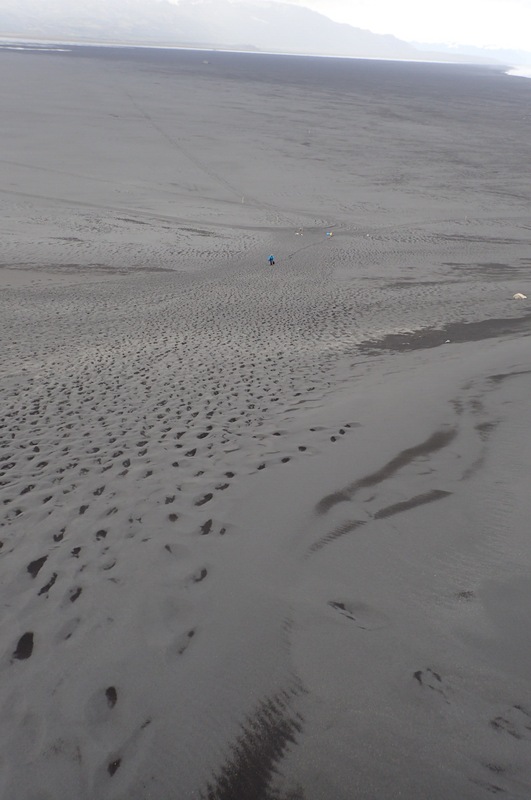 The sea is pushing everything back onto the shore creating huge sand bars and barriers that force inland water into lagoons of water, mud and sinking sands. 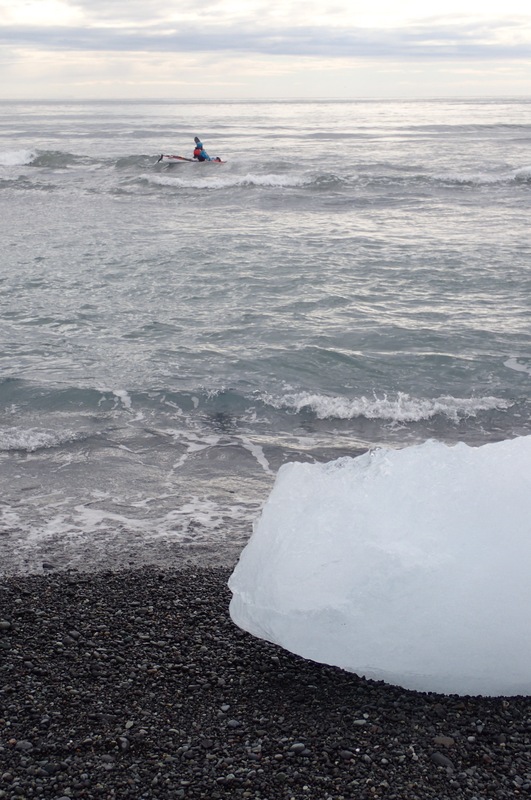 It is considered to be one of the most dangerous stretches of coast by Icelanders themselves. 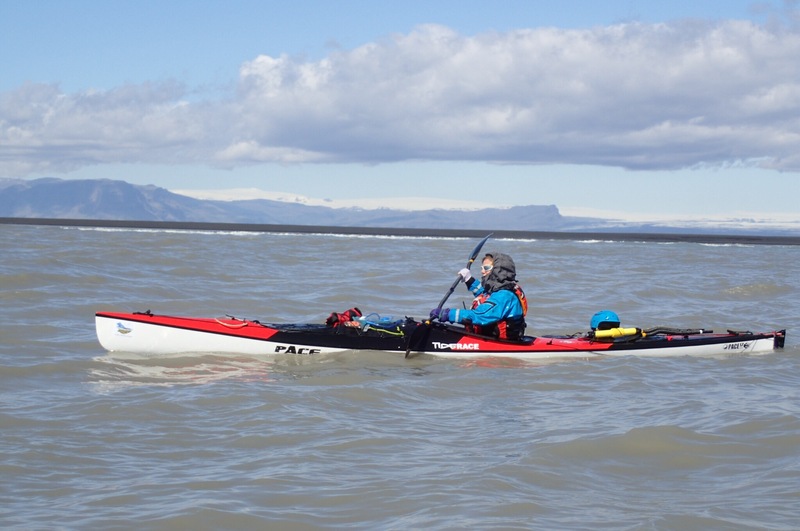 We left Höfn to continue west with the forecast promising up to six days of ok weather, with the first three being good. 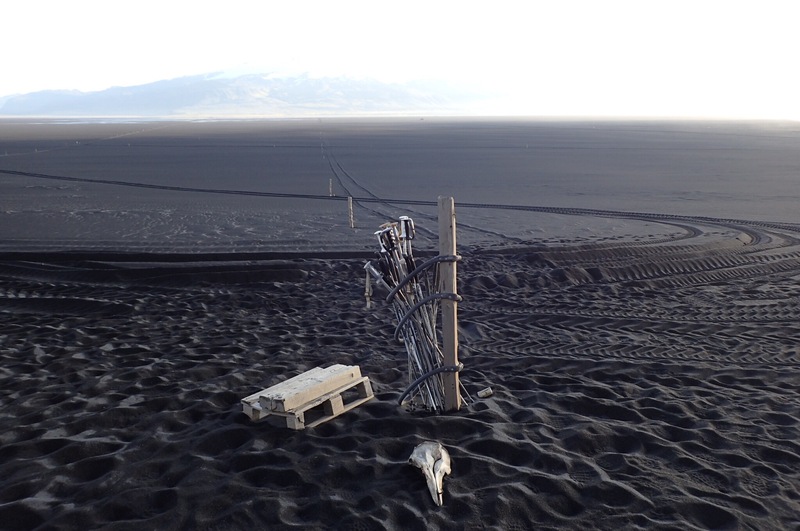 We had about 240 kilometres ahead of us to Vik, the next place with a chance of better landing and protection from conditions. However, even Vik does not have a harbour, just a wall. Least is to say that we were a little bit apprehensive of it all. Yet, once we left the safety of Höfn, we had to go. Our strategy was to minimise our presence in the danger zone, where the sea and the land meet and only approach it twice a day, at the start and at the end. We decided that if possible, the landing places need to meet the following criteria: relative safety in landing, access to water, ideally shelter if we become stuck, and possibility to walk away to civilisation if needed. A dirt track would be a bonus as distances here are really huge. We definitely wanted to avoid stopping in the areas where we would be cut off from everything by rivers and sea should the weather change. And this is how the first three days in south coast went. We were aiming to Jokulsarlón, an ice lagoon, right on the ring road and very popular. At first, after two days of high winds, the sea was still bouncy and lively with a promise of it calming down later. We were following a long wall of steep shingles. This is it, we thought, long boring stretches are here. Fortunately as it was early in the morning the sun was behind us shining on the glacial mountains in the distance. As we continued, the individual small glaciers leading down into the valleys uncovered giving us an ever changing image of peaks, valleys, ice, green grass, and scattered houses. We were wondering which valleys were inhabited by farmers in the past, how remote they must have been, and how far have the glaciers receded. In the breaks between we watched cars on the Highway 1, and had many meaningful conversations about their performance and journeys. Once we approached Breidamerjökul, part of the main glacier Vatnajökul, a black beach started, fortunately bordered by pylons. It was three and half minutes between them, they went on for miles bringing us closer to the lagoon. 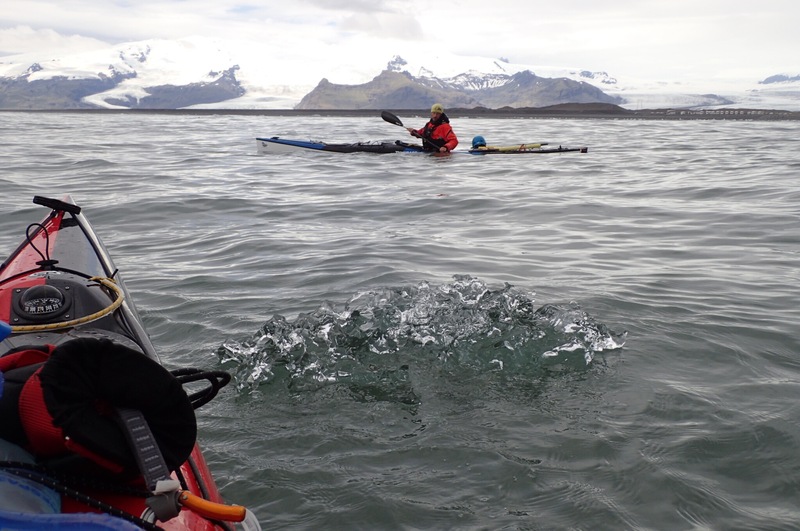 Then, just when it started to be a bit too repetitive, a piece of something appeared in the water. A piece of ice! We were here. Time to look at the landing places. It looked intimidating, waves rising and crushing onto shore from a bit of hight, but was actually alright. 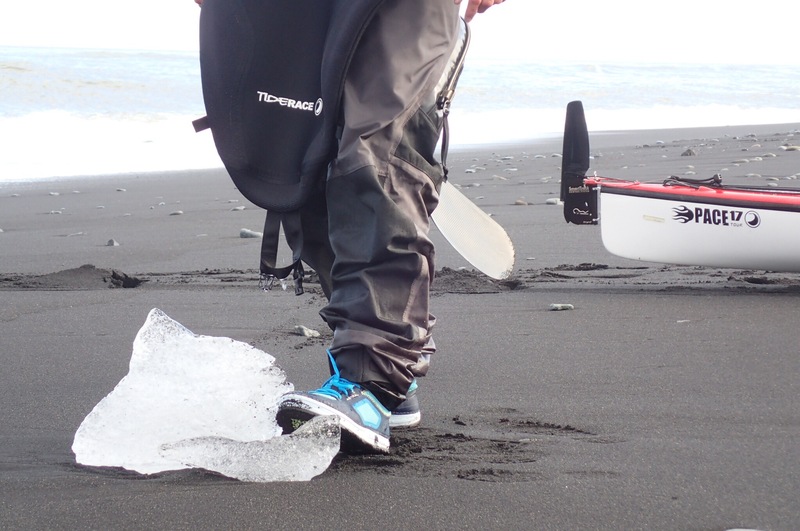 White ice on black beach turned us into kids and we took many happy photos. We woke up early and timed our departure with the opening of the cafe. Not much for the coffee, but to refill our water bags. 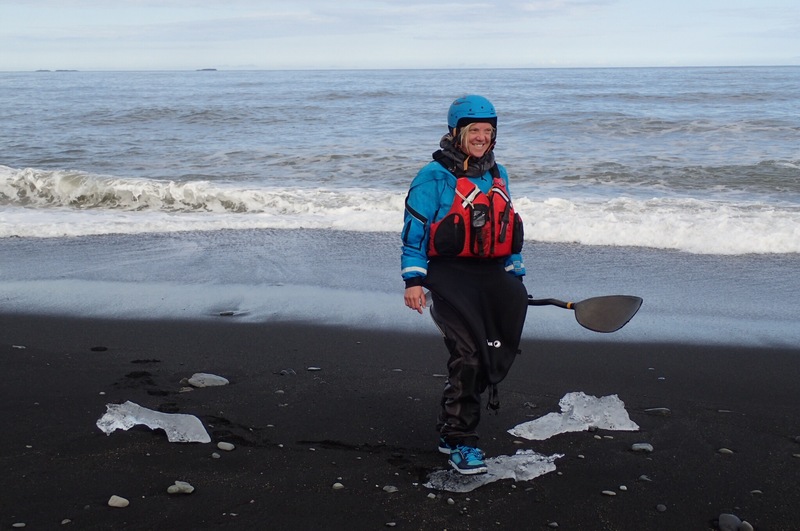 We spent half hour paddling and posing between pieces of floating ice coming out from the river mouth. Then the next stretch started. The Öræfajökull was sitting hight above us watching us with small eyes and reminding us of octopus spreading its tentacles into the valleys. 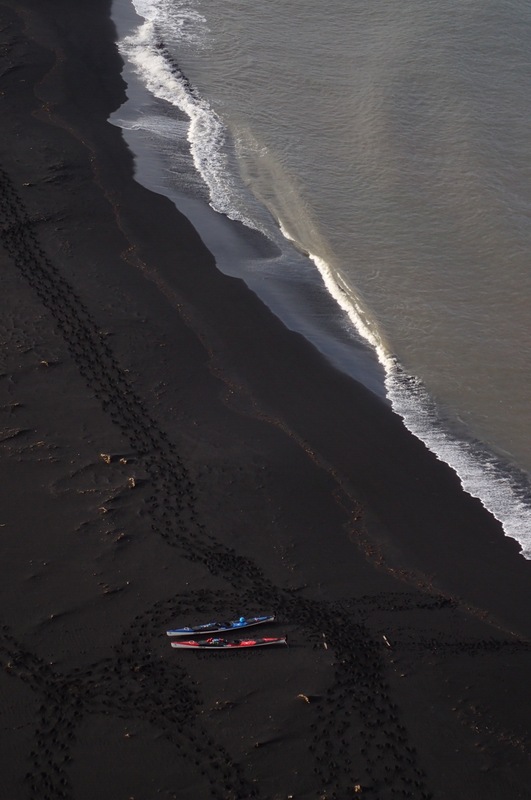 Once we were out of his eyesight, the black beach started again, this time with scattered remains of shipwrecks. 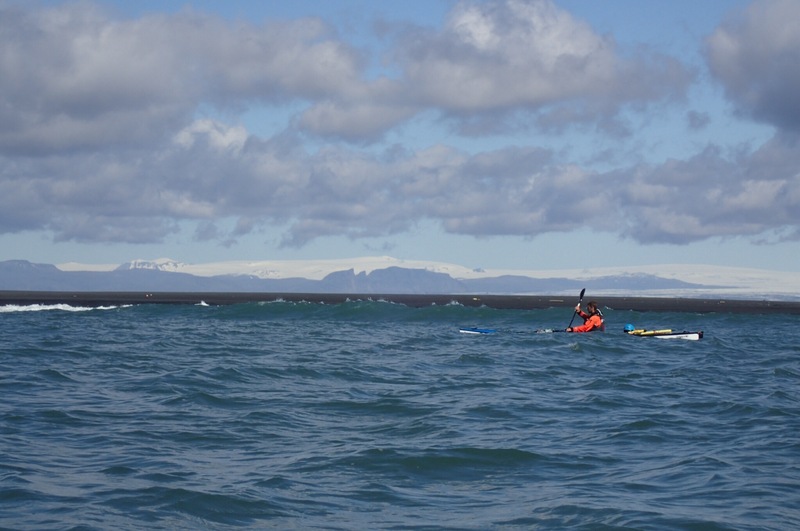 Not really something I want to see when paddling here, but they made interesting structures to pass by. 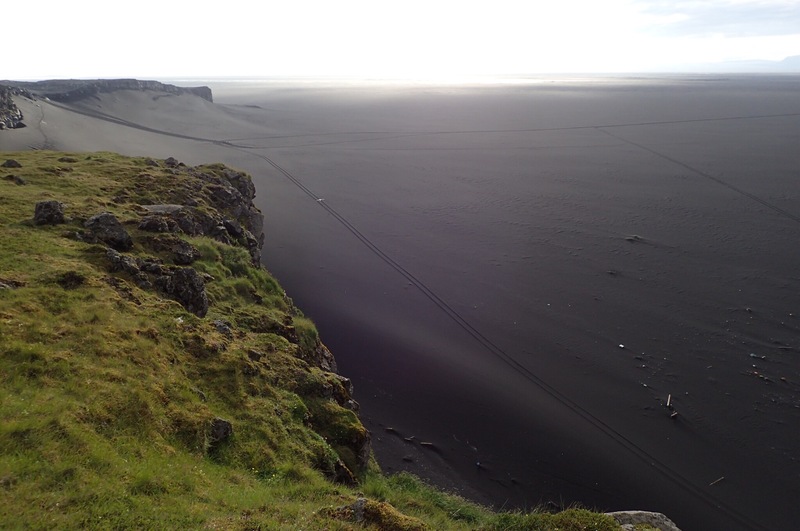 The headland of Ingólfshöfði was long visible ahead of us. As we approached it, it looked more and more like a paradise sticking out of the surrounding black desert. Höfði means headland, this one was 75 metres high formed by cliffs with nesting birds. We knew that on top is an emergency shelter and decided to stay there for a night, as we don’t like camping on sand. It also creates a corner providing a sheltered landing between cliffs and beach. 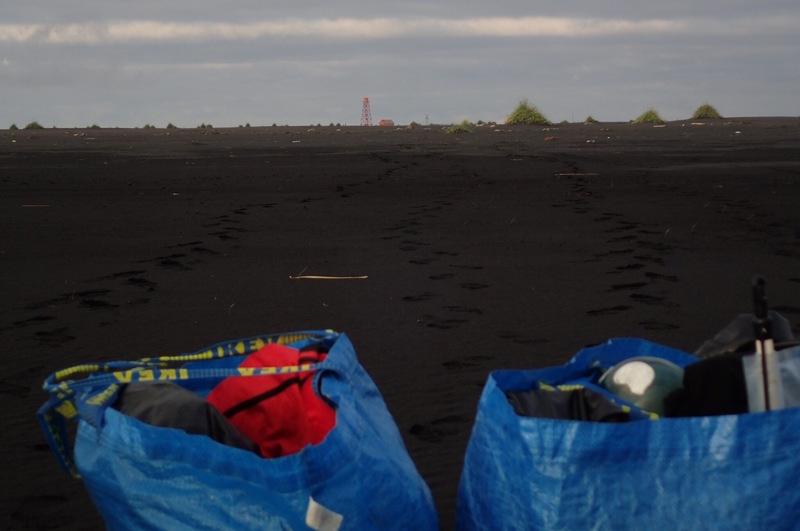 It took three quarters of an hour to get our stuff to the shelter, walking on the beach, then up a sandy hill, then across small lava field on the top. At the bottom of the hill was a place that had lots of old skiing poles tied together. Straight away we knew what it meant, however could not take any as we had both hands full. We were just hoping it won’t be that bad. 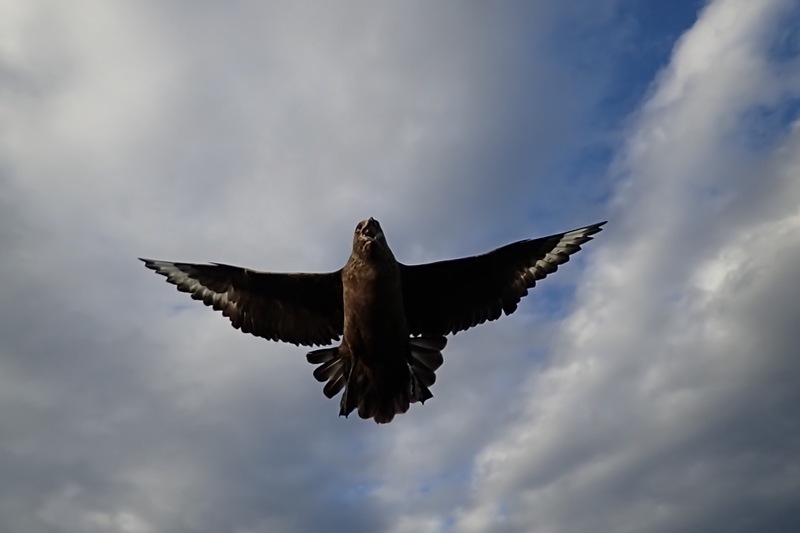 It was, the skuas protecting their young ones and eggs do fly rather low and with high intensity. It wasn’t just the comfort of the hut we were after, we wanted to see the landscape from the top. 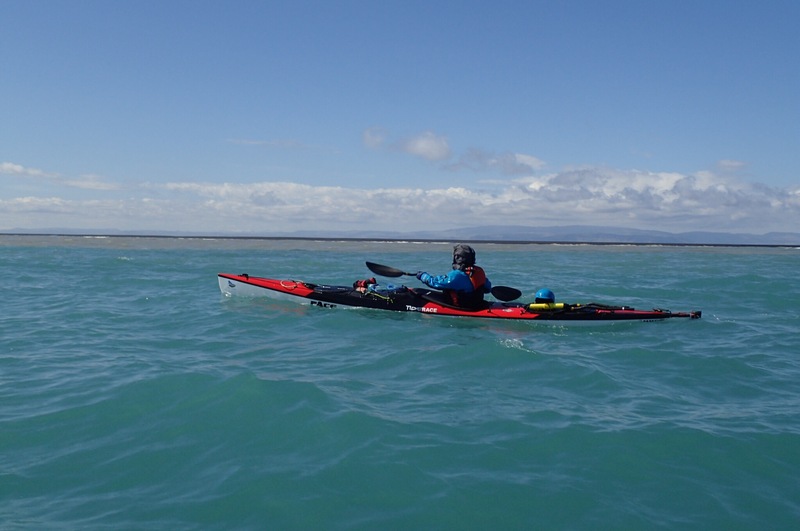 We thought we were alone at the end of the world, but once we went for walk and looked down to where our kayaks were, we noticed a fresh traces circling our kayaks, that looked like being left by a group of horse riders, but now long gone. We launched, and once we left the cliffs behind, we settled into a pace which we were happy to keep for the next many hours. The glacial mountains became a distant sight and just as we were getting used to the view of the black beach, the fog came. Oh no, we thought, that will be a hard day navigating just by the sound of the surf crashing into the shore. Fortunately it lasted just few minutes and for the rest of the day our biggest worry was not to burn. I do suffer with sun blisters, soon my skin became prickly despite using strong sun cream and it was time to find some cover. Pogies are too warm under hot summer sun, so a little improvisation was needed. Here I go, my hands covered in headscarf, and a pair of underwear, the only two things that could be found while afloat. 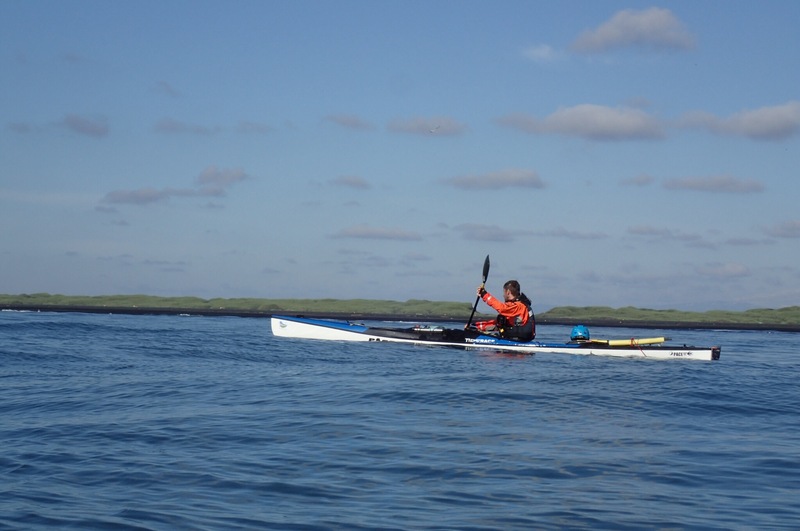 We were paddling along an area called Skeirðarsandur, there is nothing but dozens and dozens of rivers flowing into the sea. Each river mouth announced itself by a change in water colour from blue to chocolate. 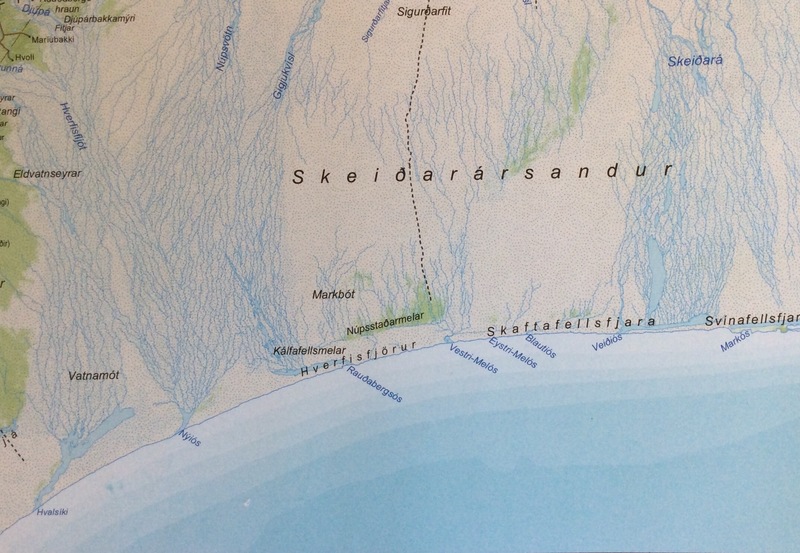 Surprisingly the boundaries were very clear, looks like glacial and sea water don’t want to mix. 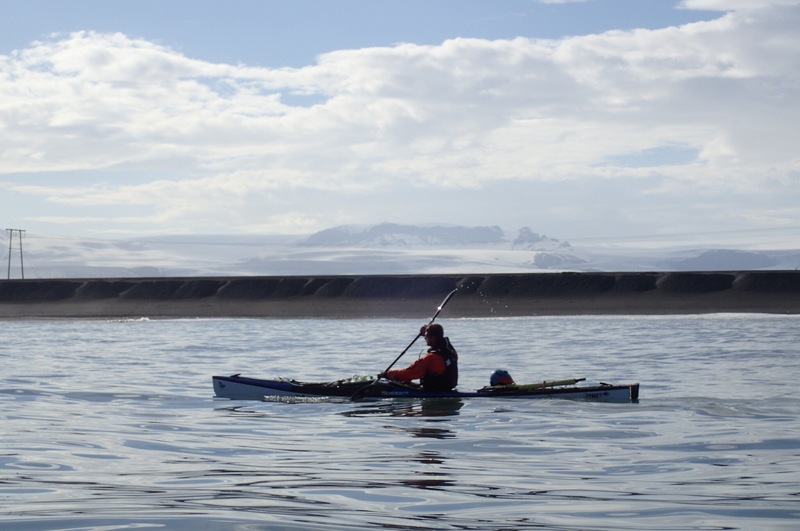 The monotony of our paddling was there and now interrupted by a need to go further out to avoid breaking zones. Also we passed eleven orange buoys lying high on the sand. Here is picture of Michal and the sixth one, which gave us a slight feeling of deja vu. We were aiming to land by the lighthouse and shelter at the Skaftarós estuary. 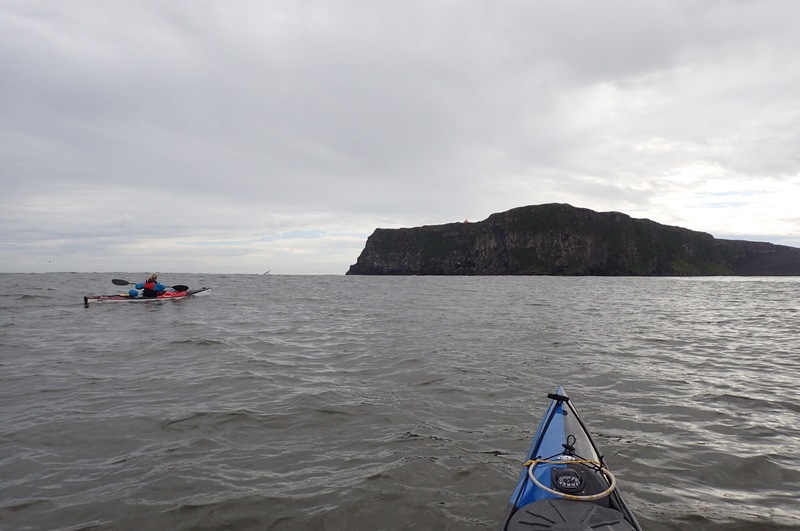 We were paddling against the sun at this point, which was playing effects with our sight making the lighthouse and hut to float in the air and a car driving on water. What we observed here in Iceland was, how difficult it was to get a real scale of things or distances. We thought we got used to it, but here, it was really hard to predict the size of the crushing waves. They covered a wast area of the river mouth and at some point it almost looked like we won’t be landing here. We stopped for a while, had a snack and contemplated what next. The wind pushed us slightly towards the shore, and we realised that it might not be as bad as it seemed at first sight. With our helmets on, we hopped through the breakers on the first sand bar and continued paddling in a surf zone, which was actually fun. I never thought I would be saying that. By the time we made it to the shore the lighthouse and hut were back firmly on land and the car was on the shore with two people going to fish in the river. As we really really don’t like camping on sand, we once again aimed for the shelter. The walk was only half hour this time, and the shelter was a lovely surprise. According to the display on the wall it was built as a store in 1920 when a motorised ship was being used to deliver goods to east coast.the store worked for twenty years before part of it was dismantled and moved somewhere else. Then it looked like it was serving as a life boat station. Nowadays it is still used as an emergency shelter, but also as a museum, so it had a flushing toilet. Marvellous. Only, we could get water into the toilet cistern but not in the tap, so no possibility for refilling our bags. We were aiming to the next lighthouse with a shelter, a last one before Vik. Blue sky, white clouds and grass covered dunes provided a fitting background for the calm sea. Not even the brown water coming out of yet another river could spoil this idyllic picture. 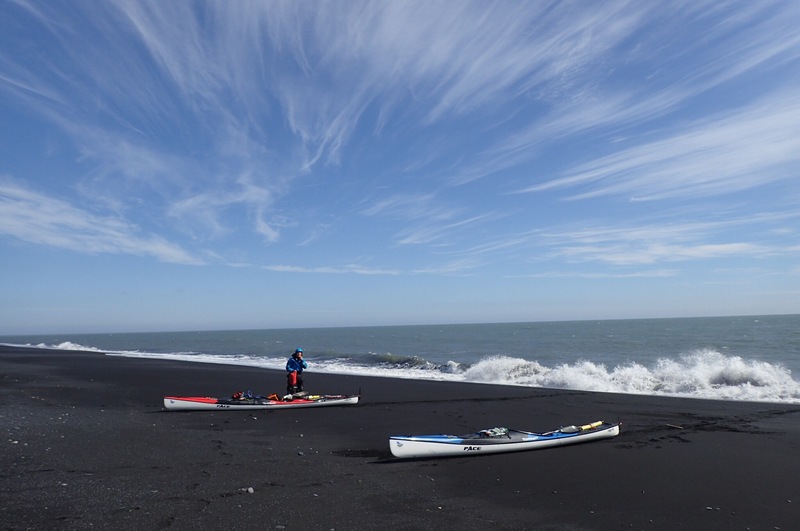 This lasted exactly three hours, first the landscape changed to black sand and nothing else, then the head wind started. Now, crossing the river flows became more challenging, we couldn’t wait for the lighthouse to appear. It did at last, still, we were far away. The wind got stronger, we pushed harder. Yet, it kept staying some distance away. We crossed what we thought to be the last river mouth just before the lighthouse, and thought, that within an hour we would there. Half hour later, when we started to reverse rather than move forward and the sea was picking up threatening to make later landing more difficult, we gave up. And that was the night when we had to camp on the sand. Although we didn’t give up without the fight, as I wrote in the previous blog post.